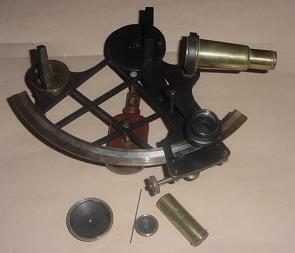 This is a sextant specifically designed for coastal surveys. Not a nautical sextant. As it is for use as an all day working instrument and not for a few diurnal observations it is made much more solid and its optics take a more extended field of view. It is used horizontally as a surveyor would, and is thus not furnished with filters. 1) The box is also extremely sturdy. Its sides are 1/2” thick. 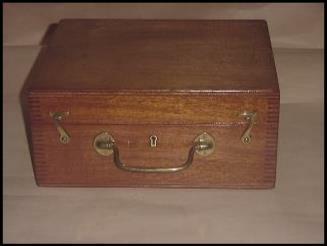 It retains all of its original attractive varnish, In new condition. 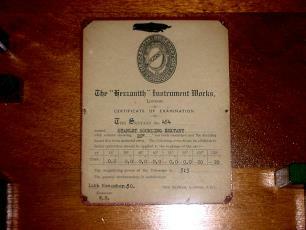 2) Lid bears certificate of examination . 4) Shows the individual accessories. The telescope has an additional eyepiece for different magnification. It is not a second telescope. 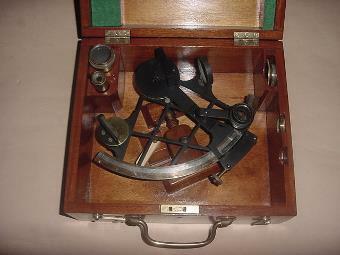 The large peep sight (bottom left of photo) is usually seen only with this type of sextant. The silver register scale ranges from 0—200 degrees. A green filter is present. There is a fitting for a second. Otherwise the instrument and its accessories are in lovely condition. Reference: Surveying and Levelling Instruments. William Ford Stanley, 3rd Edition 1901. p. 411 et seq.